Missoula has all four seasons - the original divisions of the year as determined by Mother Nature. We don't have a "mudslide season", "tornado season" or "hurricane season", and the simple thought of a Tsunami is ridiculous! So no matter when you decide to visit us, you will find a spectacular season waiting just for you. Whether relaxed or invigorating, our seasons are sure to keep you entertained and create a life-time of memories. 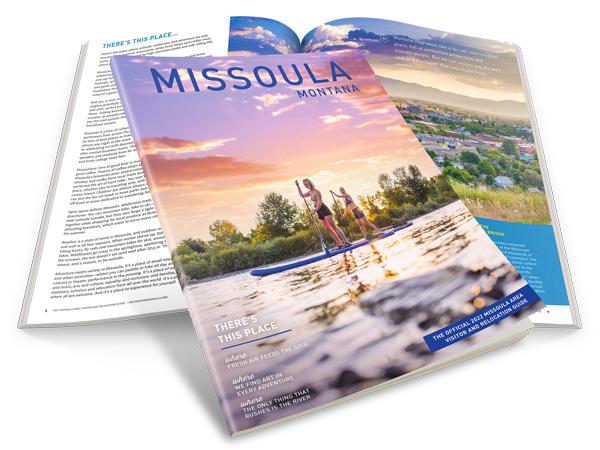 Click here to learn more about Missoula's weather. The flowers and trees begin to bloom, the snow is melting, and the grass and bushes come out and begin to show their true colors after a long, cold winter. Mount Sentinel and Mount Jumbo are glowing a bright green, and the skies are mostly clear and sunny with patches of rain here and there. Oh, we still get an occasional snowfall in the spring, right up until June some years, but not enough to fret because spring is here. Summer in Missoula is glorious, ranging from the upper 60's on the cooler end to upper 90's in August. Locals can be found with paddleboards, tubes, rafts and boats, enjoying our numerous rivers and not so distant lakes. Fall is a season of change. The colors, the weather, the University is back in session, the snow birds are packing up to wait out the cold months down south, and snow is gathering on the surrounding mountain tops. This time of year will begin to see crisper mornings that carry a layer of frost on the ground. Snow, snow, and more snow. Is there a better time of year? It is a rhetorical question, but something that goes through the minds of those living in Missoula who are "praying for snow." The ski lifts begin running and the sledding hills are filling up with kids and adults alike.